Sharing knowledge and passion for Irish lacemaking! Bobbin Lace, also known as Bone or Pillow Lace – because of the bone used to make bobbins and the hard pillow that supports the work in progress – is the oldest form of lace known in Ireland. Pieces survive that date back more than three hundred and fifty years. A combination of woven and plaited threads, bobbin lace probably originated in the Mediterranean region, but at what time is still undetermined. Until recently, surviving bobbins gave a date somewhere in the fifteenth century, but an archaeological dig in the eastern Mediterranean has yielded items positively identified by the local lace-makers as bobbins. This find offers a new date as far back as the third century. From the 1550s onwards there are both pattern books and surviving examples of bobbin lace. Vast quantities of this lace were produced in the Renaissance era and afterwards, and the silver and gold lace of the courts of Europe would always have been produced with bobbins, the thread (linen coated with real silver and gold foil) too intractable for needle techniques. Bobbin lace was taught in Ireland up to the 1920s but thereafter seems to have disappeared until its revival in Dublin in 1985 by Ann Keller. Ann became interested in making bobbin lace after studying Fine Arts but could not find a teacher in Ireland. She managed to find a teacher in the UK, and later enrolled in the English Lace School in Devon. On her return to Ireland Ann started giving classes in bobbin lace making, later also producing books of original patterns with instructions and developing methods of translating Irish Celtic design into workable Bobbin Lace patterns, which has brought Irish character to the lace and has proved popular. 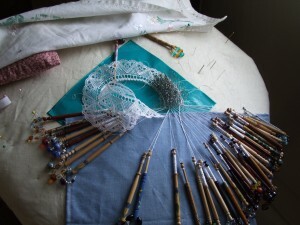 Today Bobbin lace is once again made with enthusiasm by many lace-makers throughout Ireland. Most make it purely as a therapeutic and rewarding hobby, but a few also market their work, mainly motif items such as brooches and pendants, but also collars, handkerchief and clothing trimmings, and wedding and christening lace, and most recently, jewellery, some embellished with crystals, pearls and charms. The new innovations appeal particularly to the young generation. A number of children have joined groups of Young Lace-makers and Bobbin Lace is taught to children from the age of five upwards. The young Lace-makers in particular enjoy experimenting with colour in their work, which is most effectively for jewellery or for pictorial motifs such as butterflies and owls, and Christmas ornaments. However, they also produce good pieces of traditional style using classic patterns and threads, an important factor for the continuation of the quality of traditional lace-maker’s art. Bobbin Lace is unique among the laces in the decorative appearance of its tools. In most countries the bobbins are plain sticks of wood but Irish lace-makers have followed British traditions and most of the bobbins used in Ireland (sadly there are no known Irish-made antique bobbins in existence) are the English Midland style, spangled with beads and often decoratively painted. Irish lace-makers take delight in collecting these bobbins, and also the beads which make the spangle at the bottom,( there to weight the bobbin and prevent it rolling during the work). For some the beads themselves have become a special interest, as have the woods and bone used in bobbin making. A small number of wood turners have made bobbins here in Ireland, and being keen to use local woods as much as possible, have used Irish Bog Oak and Bog yew, which make desirable collector’s bobbins when available. Bobbin lace, perhaps more than any other lace, has brought lace-makers together from far and wide. Always eager to exchange ideas and established patterns, also creates new designs, and to see each other’s bobbin collections. 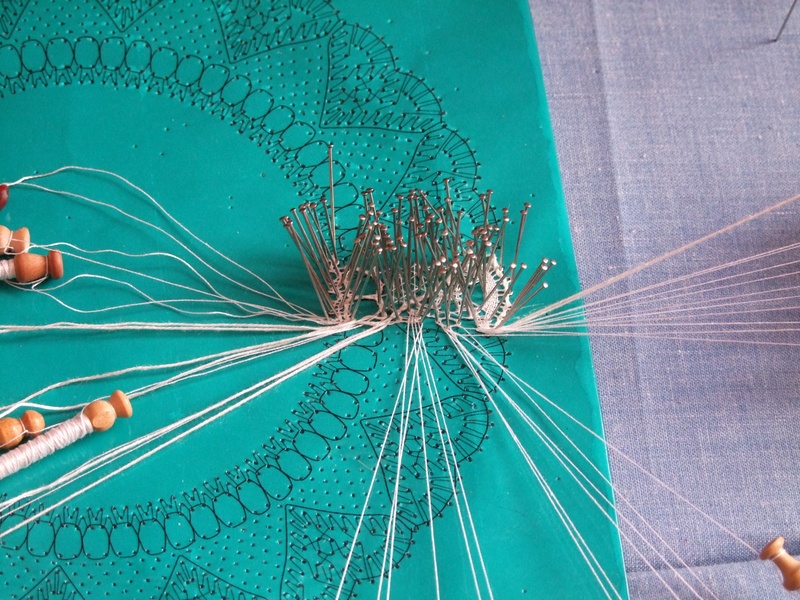 Bobbin lace-makers tend to work in groups rather than alone. This would have been the case in bygone days too as many of the larger patterns were often made in pieces by many lace-makers and then joined together. Nowadays lace-makers are finding these gatherings as valuable from a social and friendship standpoint as for their lace-making.